Gritty Pieces allow Cabinet Makers to Expand Their Offerings by selecting Unfinished Kitchen Workstation Furniture from YesterTec. Cabinet builders across the country now have a new way to meet customers’ needs and desires with YesterTec’s “Gritty Pieces” kitchen furniture. Gritty Pieces are just like the company’s regular line of revolutionary workstation furniture for the kitchen, but they are unfinished so you can add your own special touches. From a single freestanding piece to match a custom cabinet design, to an entire kitchen of stand-alone furniture, YesterTec offers factory direct kitchen furniture so you can satisfy customer demands without having to re-invent the wheel! Gritty Pieces from YesterTec provide cabinet builders with a wide range of options to add to their repertoire. You can offer customers the design freedom of freestanding furniture in the kitchen to enhance an open plan home design. Add a coordinated stand-alone Working Pantry to a near complete kitchen for variety. Or select one of YesterTec’s patented workstations that hide ovens. Then, add your own finishing touches to the hand-crafted, heirloom quality pieces – distress them, add hand-painted designs or finish them with a special signature glaze. Even finished stone tops, complete with all cutouts, holes and edges are available to complete each piece. The result is a truly original kitchen that customers will love – and so will you. Ordering Gritty Pieces is simple –the $10 (reimbursable with purchase) YesterTec design catalog is all you need. You’ll receive factory direct prices and YesterTec’s exclusive fast quote estimating service. Plus, you can use the company’s legendary 3-D CAD planning services for complete kitchen orders. It couldn’t be easier! Gritty Pieces are shipped blanket-wrapped on air-ride trailers. Most pieces are transported in one piece, although some of the larger pieces are broken down to fit through openings. YesterTec Gritty Pieces arrive fully assembled, sanded with 150 grit and unfinished. The Gritty Pieces are ready to be partially dismantled to complete your finishing process. Then they just need to be reassembled and installed. U.L Listed pieces, the ones that conceal appliances, are sent with their proper labels and all wiring chases pre-wired. And all pieces come with the famous YesterTec sequentially numbered label! 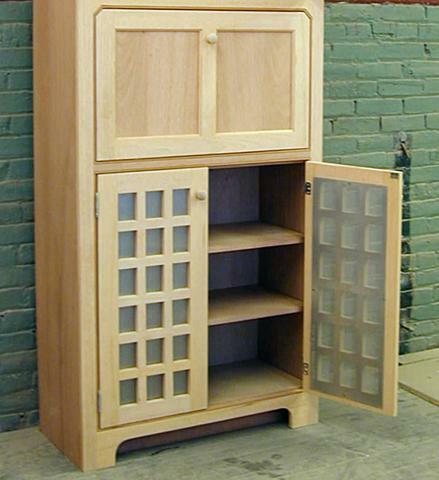 Now, with YesterTec Gritty Pieces, you can offer customers custom-designed, high-quality kitchen furniture to enhance your handcrafted cabinetry, or stand on its own, without having to start from scratch! So let us save you some time, precious time you can use for other projects, knowing that when you receive your Gritty Pieces, you’ll only need to do what you do best to turn them into masterpieces!